Beeswax Candle Works Inc offers several glass candle holders for burning our 100% pure beeswax candles. Clear glass votive holder. Ideal for our Small and Medium Votives. 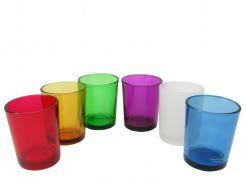 Colored glass votive holders. Tapered. Ideal for our Medium, Large and Extra Large Votives. Available in Five Colors: Amber, Blue, Frosted White, Green, Purple, Red.